Chinese food box is essential packaging box and uniquely delivering food item. These boxes are made more appealing with premium materials and printing technology to attract consumers. Leading packaging companies provide different sizes, shapes, and colors of these boxes to the customer. These boxes are usually shipped flat and do not need professional skills for assembling and use. Durable and sturdy materials are used to package and deliver the tasty Chinese food item in a delightful way. The nature of the material makes it possible for the food item to remain in its fresh taste for an extended period. Chinese food box is designed to package and deliver the mouthwatering Chinese delicacies in the most appealing way. The packaging box is designed with highly attractive colors to display the rich cultural heritage of the Chinese people. The Chinese people are well known for their arts and colorful festivals and displays. This is why it will be more beneficial to represent their interest by delivering tasty Chinese food in a bright and highly attractive Chinese food box. The material used in making this box is also different. Sturdy materials are used to print the Chinese food box. This will make sure that the product stays fresh for a long time. The thickness of the material also varies. This can range from 280 GSM to 550 GSM. To make the Chinese food box more attractive in the eyes of consumers leading packaging companies to make use of modern technology to print the food boxes. These boxes will also help to enhance the business reputation. Handles on these boxes will also enable consumers to carry their food conveniently. Especially when the food is hot, the handle will make it easier and safe for the consumer to take their delicious meal home. The handle is also created with the same material as the packaging boxes. The material is sturdy and durable. When used for customizing the handle it can also bear the weight of the food item without breaking. 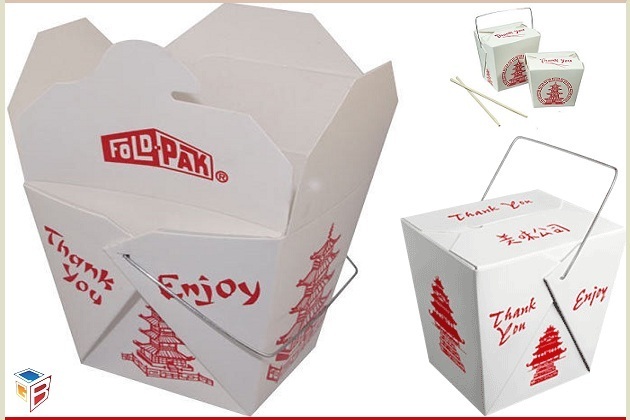 The size of the packaging box is also a significant factor to consider when creating your Chinese food box. In many occasion, consumers may prefer packaging boxes that can store up more products. So to satisfy customers, sized packaging boxes can be created for that purpose. The shape of the packaging box can also be made in a unique way to give your product unique brand identity. It can be designed in a unique way that consumers can be able to identify your Chinese food box easily. The Chinese takeaway boxes are created with premium cardboard material which makes it easier for the packaging specialist to print all kinds of captivating designs. Bright and attractive colors are also used to print these food packaging boxes to capture the attention of potential buyers. The material used in making this food packaging box also enables the food item to stay fresh for a long time. The material also helps to prevent the food item from getting spoilt on time. The packaging box is also built with handles to make it convenient for the consumers to carry their mouthwatering delicacies home. The box can also be used as an individual marketing tool to create more awareness about the business and tasty Chinese foods. The address, business logo, and other vital information can be printed on these boxes. Instead of spending a tremendous amount of money to advertise the business to Chinese food lovers, these packaging boxes can be used as a cost-effective means of boosting the company. Chinese food box is made more appealing with modern printing technology such as the digital and offset printing technology. Leading packaging companies make use of this technology to deliver packaging boxes that can take your Chinese food business to another level. Quality finishing option such as glossy, matte, spot UV, aqueous coating, embossing, gold foiling, silver foiling, and other high-quality finishing options are used to make the packaging box more attractive and durable. The Chinese food box can be designed into any shape, sizes or dimension to satisfy the packaging needs of the consumer and the food item. Hiring A Packaging Professional: What Are The Benefits? There are lots of benefits in hiring a packaging professional to work on your project. As a packaging professional who has executed hundreds of plans for different companies, your business, and packaging project will benefit a lot of the wealth of experience gathered. However, many individuals and companies are claiming to be professionals whereas they are not. That is why it important for you to do your research carefully to choose the right individual or company for your packaging boxes. Modern technology has also made it possible to create any design or style of packaging boxes. So when customizing a unique packaging box for your product, ensure that you make use of the right printing technology and techniques. You packaging box is also vital to the success of your business and product. That is why you must create the best to take your business to a brand new level.